Visiting Germany is a great opportunity to explore the culture, cuisine and landscape of an amazing European country. Many visitors head straight to major cities like Berlin and Munich. While that is a great way to begin exploring Germany, there is so much more to enjoy. Aside from Oktoberfest and the Berlin Wall, there are extraordinary cities, villages and historic landmarks you won’t want to miss. From the fairytale Christmas celebrations in Nuremberg to the thriving port city of Hamburg, here are just a few of the most underrated destinations in Germany. Aim to add one or more to your next getaway in Germany. 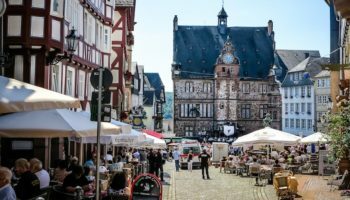 Close to the border with Luxembourg, and in the heart of the Moselle Wine Region, is the city of Trier. Dating all the way back to Roman times, Trier is often considered to be the oldest city in all of Germany. A major reason to visit Trier is to see some the city’s ancient Roman Ruins. You might want to check out the Kaiserthermen, or Roman baths, as well as the Roman amphitheater and the ancient Porta Nigra Gate. Sample the local wines made in the region, and be sure to try the unique apple wine known as Viez. If you love culture and literature, then the town of Weimar may be a kind of mecca in the heart of Germany. Weimar is known for being the home to Goethe and Schiller, two of the most significant and respected authors in the world. In centuries past, Germany was known as the Land der Dichter und Denker, or the country of thinkers and poets. In Weimar, that still rings true. You can tour Bauhaus architecture at the Bauhaus-University Weimar, see the Goethe and Schiller Memorial in the Theaterplatz, or visit the Stadtschloss, a castle that is also home to a remarkable art gallery. Right on the border with Belgium, you’ll find the charming and historic town of Monschau. 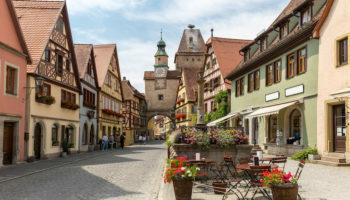 The town looks very similar to how it did 300 years ago, and its half-timbered buildings and cobblestone streets are a big part of the area’s appeal. Most visitors come to stroll through the Old Town and spot landmarks like the 18th century Red House or the famed 19th century Mustard Mill. Monschau is also a gateway to the nearby Eifel National Park, which is an amazing spot for hiking as well as mountain biking. Frankfurt am Main is a bustling city that also serves as a major financial hub in Europe. 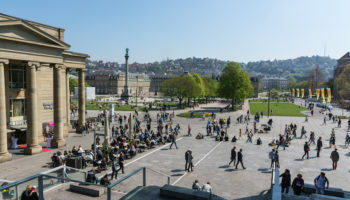 It’s where you’ll find the German Stock Exchange as well as the European Central Bank, and countless trade shows are held in the city each year. Business aside, Frankfurt boasts some amazing diversity, culture and architecture. In the old city center of Römerberg, you can admire buildings dating back to the 14th and 15th centuries. In the district known as Museumsufer, pick and choose from over a dozen world-class museums. 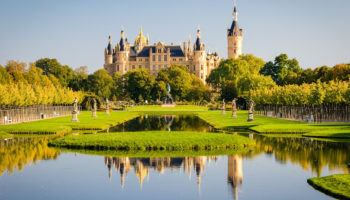 Though Neuschwanstein is by far the country’s most visited castle, there are plenty of other impressive castles in Germany, and one of the most famous is the Hohenzollern Castle. Located just outside the town of Tübingen, the present castle dates back to the 19th century. This ancestral seat served as the home to Kaiser Wilhelm II, and today it is a major tourism attraction. On a visit to Hohenzollern Castle, you can admire the enormous and detailed family tree taking up the walls of an entire room, and you can stroll through perfectly refinished bedrooms. Don’t miss the royal jewels, arguably one of the most breathtaking collections in Europe. The guided tours are available in English and well worth your time. One of the oldest and most interesting cities in Bavaria is Augsburg. Since it just an hour’s drive or train ride from Munich, Augsburg is a great destination for a day trip or a longer stay. This is definitely a university town, so expect plenty of history, lots of fantastic nightlife and a youthful and well-educated population. Start your sightseeing at the Mozarthaus, home to Wolfgang A. Mozart’s father. Then, head to the 16th century housing estate called the Fuggerei, which still offers low-income housing for the staggering low rate of just one Euro per year. Hamburg is nicknamed Germany’s Gateway to the World, which is largely because it is such a large port city. 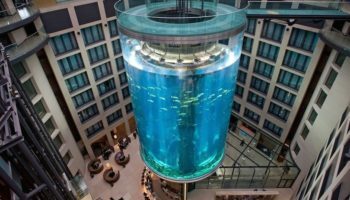 However, Hamburg is often overlooked when it comes to planning a vacation. In reality, Hamburg has a lot to offer visitors. Walk to the Rathaus, or city hall, via the Mönckebergstraße. Lined with shops, this is one of the busiest walkways in Hamburg. If you’re interested in the harbor itself, opt for a boat tour along the Elbe, which will provide the best views. You might be surprised to discover that Hamburg is home to several beaches, many of which get quite busy on warm summer days. In the prime of the German Empire, Quedlinburg was a major hub. Today, it is a small town that is best known for its remarkable collection of preserved Renaissance buildings. Many of the town’s timber-framed structures date back to the 16th century, and they are in truly amazing condition. The Fachwerkmuseum Standebau, for example, is a museum located within a home built all the way back in 1310. In addition to the museums and architecture of Quedlinburg, the town is notable for its railway. The Harz Narrow Gauge Railway passes through the town and boasts spectacular views of the landscape. If you’re spending time in Southern Germany, be sure to check out the town of Ulm. Situated on the Danube River, Ulm is within view of Bavaria. It is also the birthplace of Albert Einstein as well as the town where you can find the highest church steeple in the world. Construction of the Ulmer Münster began in the 15th century, although work was only completed in the 19th century. Climb to the very top of the steeple, a whopping 768 steps, and you’ll be rewarded with breathing views and even a glimpse of the Alps. Walk along the river to find the Fischerviertel, or the Fisherman’s Quarter, for a historic view at life in the past. Located about 170 km north of Munich, Nuremberg is a city that many people are familiar with. Bavaria’s second largest city is associated with Hitler’s rallies in World War II but also with gingerbread and Christmas markets. Nuremberg has a lot to offer, and you could easily spend several days just hitting the highlights of the city. Over a mile of the Nuremberg city walls still stand, as does the impressive castle. You’ll also find a variety of medieval churches, cathedrals and administrative buildings. The Tiergarten, or zoo, is a big hit with visiting families. Round out your trip by dining on some authentic grilled Nürnberger Rostbratwürste and the sweet gingerbread cookies called Lebkuchen.